Thermal imaging is the primary method human detection on the battlefield. 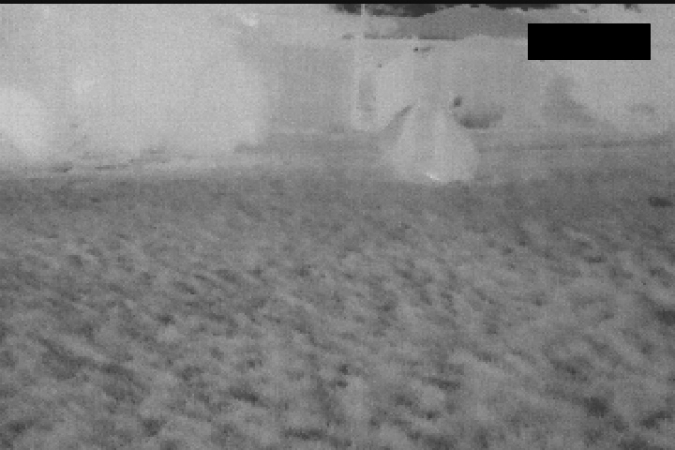 Whether it be a drone, an Apache helicopter, or an individual soldier, thermal imaging is the best tool available for the job. Thermal imagers work by “seeing” heat. Everything emits thermal energy, dirt, trees, rocks, humans. Thermal imaging is so successful at detecting human beings that it poses a threat to the average citizen. Don’t get me wrong, I feel every citizen should own a thermal imager as well. In today’s world it is becoming apparent that the average individual citizen is going to under the prying eyes of the government, but what if Joe citizen has concerns about his privacy? I’ve been through countless forums where people are searching for an answer as to how one can hide from thermal imaging. We are even working on a method ourselves (sign up to our newsletter on the right side of the page, we will let you know when it becomes commercially available). While I would like to be the first to develop a product to defeat thermal imaging, I feel that I should share the challenges in doing so. If I am not successful, maybe someone else will be. All of the ideas I’ve run across so far will not work; Space blankets, glass panels, mud, wet suits, none of it works. The key to evading thermal imaging is the same as any camouflage, just with different parameters. You will not ever “disappear” from a thermal imager, just the same as you won’t disappear just by wearing Multicam or ATACS. In visible camouflage you use colors and specific patterns to do so. You have to blend in and use cover and concealment. You wouldn’t go unnoticed wearing traditional camouflage laying down in the middle of a parking lot, you shouldn’t expect to do the same in thermal. In both examples knowing your surroundings and the characteristics of what is searching for you is the key. The most obvious issue in evading thermal imaging is dealing with the heat that a human produces. It is impossible to stop the body from producing heat and it is also impossible to inexpensively contain all of the heat the body produces. Expensive thermal cameras, such as the ones in drones and helicopters, sense the actual photons emitted from an object. Less expensive handhelds use a material that measures the differences in temperature. Either one first needs the heat from your body to reach the sensor. If your heat cannot reach the sensor, you cannot be seen. A physical object between you in the camera, such as the roof of your house, a boulder, or a tree will stop the infrared energy from reaching the sensor. The problem is you can’t continually surround yourself with any of these objects. You must, however, put some barrier between your heat and the camera. The above example of the space blanket will reflect heat back to your body and the imager cannot see through it, but if it touches your body the heat will transfer through the material rather quickly (like one second). If an air gap was kept between your heat and the space blanket this would slow this process down. The Afghans have used wool blankets to mask their signatures from thermal imaging. If they hear a chopper or suspect an eye in the sky is looking for them they will drop on the ground and cover themselves with a the blanket. If the blanket starts out at ambient temperature the amount of time they will reduce their signature varies, depending on the temperature relative to their body heat. This works because the blanket acts as an insulator. As soon as the wool begins to warm they will become visible again. I suspect this method works for mere seconds, but imagine if they had a wool blanket, a space blanket, and another wool blanket. The heat would first have to transfer through the wool. The space blanket would reflect most of the heat back, but some would leak through. The second wool blanket would then begin to heat up compared to the surroundings. This wouldn’t work forever, by any means, but it would give the insurgent one thing; more time. Insulating your heat from the imager, such as the wool blanket. The more effective the insulation, the more time you have bought yourself. Spreading your heat over a larger surface area. Your body has a finite surface area, if you can transfer your body heat to a larger object, that object will be cooler. Think of a heat sink. You can vent heat to the atmosphere. The thermal imager cannot see the heat traveling through the air, at least not at the temperatures we are talking about. It would have to be directly to the atmosphere because if the heat were to heat up your cover, that would be noticeable. You can mechanically trap heat. Note, heat is also relative. If your entire environment is 98.6 degrees, you won’t disappear by any means, but the advantage of the thermal aspect will be lessened. Note 2, all thermal cameras have what is called a dynamic range. Imagine I had a palette of 10 shades of gray available to me. As the processor of a thermal I have to assign a “color” to each temperature. The standard view would be white is hot and black is cold. If temperatures are relatively uniform, say everything the camera is seeing is between 60-70 degrees, the processor can assign a color for each degree. If the temperatures of the objects in the cameras field of view are vastly different, say 32 degrees on the cold end and 98.6 on the warm end with lots of variations in between (say a sunny winter day) the processor can no longer assign one of the 10 colors to each degree. It must assign a color to a range of temperatures, say 32 to 37 are “black”, 38 to 44 are dark gray and so on. This is a vast oversimplification but it does have an effect on the cameras ability to resolve your temperature. A real world example might be hiding near the top of a ridge. If someone was looking for you from below they would have to include part of the sky in the field of view. The sky is extremely cold, whereas the earth might be a hundred or more degrees warmer. Here is a somewhat extreme example of how dynamic range can affect an image. In the image on the left our thermal cloak is towards the top, just to the right of center. In the second image, the imager includes a good portion of the cold sky causing the foreground to wash out a bit. Lets say that you had some form of cloak that could mask your thermal signature for a period of time. You might think you are home free…but nothing is that simple. Not only does every object emit thermal energy, but it does so at different rates. Human skin is highly emissive, meaning energy is radiated efficiently, more energy for the thermal imager to “see”. Aluminum foil, on the other hand, has low emissivity. If both were the same temperature and you looked at them with the camera they would look vastly different. To make matters worse, as any object warms up, it also emits more energy. It can be likened to objects changing “color” with temperature. This is why emergency blankets and panes of glass won’t help you hide. While they might mask your thermal signature, they themselves will stand out compared to your surroundings. To an observer, an emergency blanket is just as out of place in thermal as it would be in visible light. Not only do you have to reduce your thermal signature to hide from thermal imagers, but you have to match your surroundings as well. To solve the first two equations, thermal and emissivity, you must both shield the imager from your body heat and match your surroundings. So you’ve got some kind of cloak, and you’ve covered yourself in grasses or branches native to the exact area where you are hiding, you might be “invisible” to thermal. But wait, it doesn’t end there. Somewhat like sun casts a shadow, thermal leaves a shadow. A lawn that is partially shaded from the sun will look very different in the shadows. If you were to move from the direct sunlight in the above example into the shade, you’d stand out. This is yet another reason why thermal is effective during the day. Nighttime, particularly long after sunset, offers its own challenges. After the sun sets different objects cool at different rates. If you were successful enough to create a cloak that can achieve near ambient air temperature you may now appear colder than your surroundings. Your best bet is to know what objects offer the closest temperature/emissivity match, tall grasses may cool faster than rocks, pine needles and leaves may be good options. Camouflage uses everything from prints of foliage to complex designs that blend in with the colors and shapes of your surroundings. 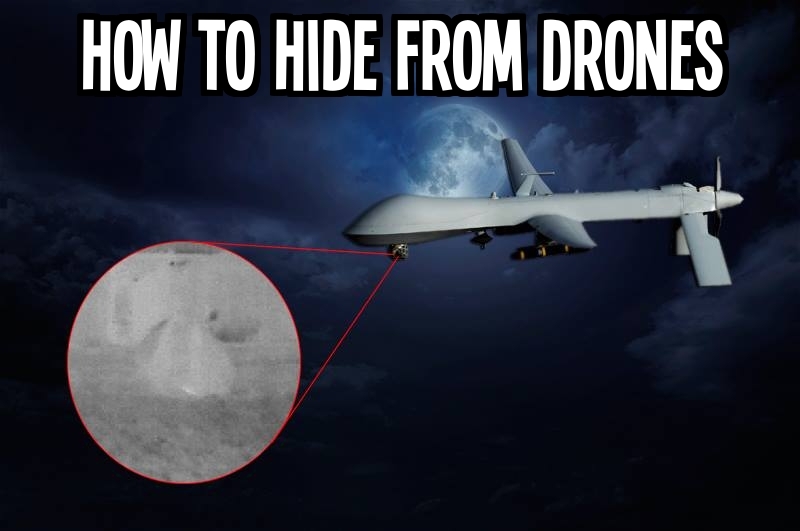 This must also be attempted when hiding from thermal as well, but it isn’t so easy (again?). Paints and dyes are really effective in visible light, but are almost useless in thermal. Ideally, the layer facing the imager would be constructed of different materials with mis-matched emissivities, sort of like covering yourself with leaves, branches, grasses, etc. This is probably not commercially viable, but if you were to do so by hand it would probably benefit the overall effectiveness of your camouflage. If you’ve masked your thermal signature but can’t quite match the emissivity your best bet is to look like something nearby, a rock, bush, a patch of bare dirt. Unless you can create something with very complex emissivity patterns you have to do the next best thing, not look human. This premise also holds true with optical camouflage, something as simple as crouching down can cause the human brain to not recognize the object as human. No technologies are infallible, thermal is no different. Most of the videos you see on YouTube involving firefights between US forces and the insurgents are already known events to the thermal operators. They’ve been called in to dispatch the terrorists. In our future make believe world, where a rogue government is hunting down citizens you can have significant advantages. Masking your thermal signature is no different than creating a stealth jet fighter. An F-22 Raptor is not invisible to radar, it still has the signature of a metal marble. If radar technology had the ability to see a metal marble it would negate the F-22’s advantage, but since radar doesn’t have the resolution it can’t. The same is true of thermal imagers, they have a finite resolution. It is pretty easy to understand, standard definition TV (the old stuff) had a digital resolution of 720×480 pixels. High Definition TV has a resolution of 1280×720 (720P) or 1920×1080 (1080P or Blu-Ray). Most of you know from experience that your eyes couldn’t resolve a persons face in a crowd at a sporting event on old TV, but you can now. Again, the same is true with thermal. High end military imagers are about the equivalent of 720P television. Handheld imagers are generally less than the old standard definition television. If you can reduce your thermal signature enough, the camera may not be able to resolve you. Military imagers can detect a person at a distance of many miles, but to achieve this distance the lensing only affords a very narrow field of view, like looking through a straw. In airborne systems, the thermal imagers will generally have two selectable options, a wide field of view for surveillance, and a narrow field of view for target acquisition. Unless they’ve already seen you, they will be searching using the wider field of view. If you’ve reduced your signature by 90%, the imager needs to be 90% closer to detect you. If the imager is far enough away, even exposed body parts will not be visible. 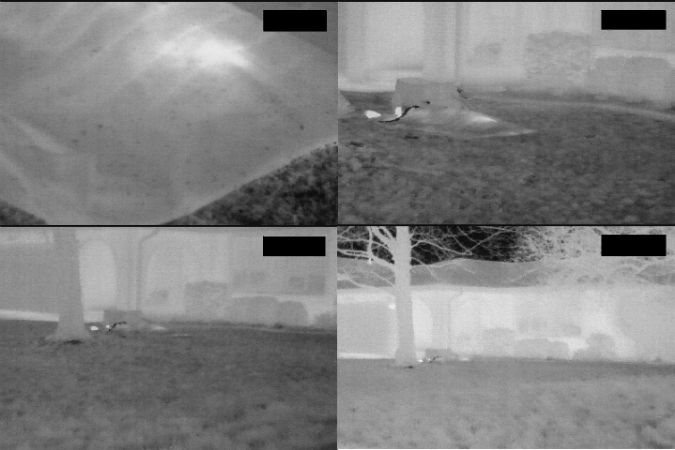 To illustrate how distance plays a part in thermal detection below are four images at increasing distances. In the upper left picture of the below example, the imager is a few feet away from the cloak. The subject was not following directions and breathing directly into it. It is very noticeable, even though the temperature difference was negligible because the dynamic range of the scene is rather uniform and the camera can tell the difference between a few tenths of a degree. You might think the cloak has failed. 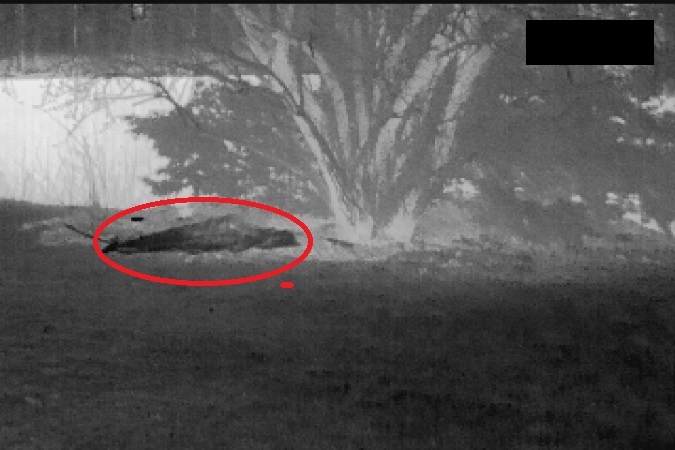 In the second image, taken from 10 yards, you can see the subjects feet sticking out and you can still see the breath print as well. In the third image, at 20 yards, the breath print begins to blend in and the feet are still bright enough in the image to take notice. By the fourth image, at 30 yards, the breath print is virtually indistinguishable from the background. The feet would probably not be noticed by an operator. The fourth picture is also exhibiting a phenomenon known as thermal crossover. Don’t get me wrong, this is a handheld imager. The distances needed to avoid detection from a military grade imager in the above example might be 10 or more times. If the feet weren’t sticking out, however, an operator might not even take notice of the small, slightly warmer area. Hiding from thermal imagers is tough, but is not impossible. Hopefully we will never be in a state where we need to hide from the prying eyes of drones, or worse, hunted down, but we’d better start now trying to crack this nut. I’d be interested in any feedback from folks that have used imagers to locate people. Would you take a closer look at any of the above examples? Would you suspect a human? For those of you who are new to the Tin Hat Ranch, we are working on a multipurpose thermal cloak. It will offer not only thermal camouflage, but optical and near IR as well. In it’s current configuration, it is water repellent and can replace the sleeping pad in your pack. For future updates and the announcement when the cloak becomes commercially available, sign up to our newsletter on the right side of the page. Also, check out our Youtube channel and “like” the Tin Hat Ranch on Facebook. UPDATE- The prototype drone cloak is headed into testing. Should the results be favorable we will begin taking pre-orders shortly. We’ve already created a Facebook page where you can receive updates, head over to dronEvader and give it a like! VITAL: Weapons disguised as Vehicle Headlights | Do More Good Deeds!